Welcome to this most interesting post. Today we look at jump starting a 24 Volt system using a 12 Volt ordinary vehicle. There are a few things to keep in mind and a few mistakes that can cost you big time, so, read carefully and make double sure you have the connections correct! Disclaimer: Everyone trying this method according to this post, do so at their own risk. Which 24 Volt systems can be jumped from a 12 Volt system? I will only speak about first hand experience in this post. As most know by now, I live in a motorhome (Bus). The motorhome has a 24 Volt starting battery configuration. It consists of two very big 12 Volt batteries connected in Series to give 24 Volts. If this is the same way your 24 Volt system is connected, the starting procedure is quite simple. 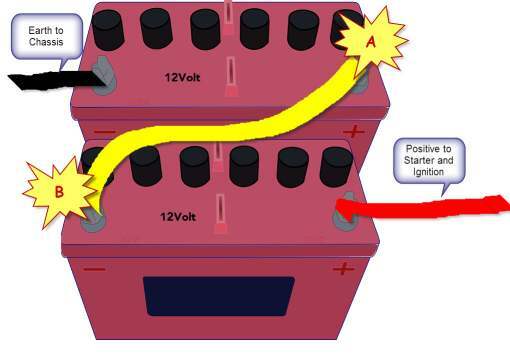 Hook the + (positive/red) jumper cable to the Red (+) terminal of the 12V car battery and the [Positive to Starter and Ignition] terminal on the 24 Volt system. (See diagram). Make sure that it does not touch anything else. Now, hook the Black (Earth/-) jumper cable to the Earth terminal of the 12V car battery. Now, hook the Black jumper cable to the – / negative terminal marked “B” in the diagram. You may hear the revs on the car drop as the alternator starts to charge the truck/bus batteries. What is happening in fact is that you are charging the one 12 Volt bus battery which in turn is sharing the charge with the other bus battery at 12 Volt. Thus it is perfectly safe. Run the car at higher revs for about one minute before attempting to start the bus/truck. Once the bus starts, quickly remove the jumper cables so that the bus alternator can take over the charging of the 24 Volt system. The same result will be achieved by connecting the red jumper cable to the + / positive terminal marked “A” and the black jumper cable to the Earth terminal or Chassis of the bus. Please leave us a comment if you have done this successfully or found the post helpful. Safe travels and hope to see you on the next post.